Since 1963, Strescon has been developing and producing precast concrete products that solve specific design problems and meet the individual needs of our clients. Over the past 40+ years, we have grown to become the largest precast concrete pipe manufacturer in Eastern Canada. Our primary market covers Eastern Canada and the US States of Maine and New Hampshire. The flexibility of our plants, the creativity of our designers and the versatility of our craftspeople permit us to offer a complete range of precast concrete environmental solutions, including:pipe, box culverts, manholes & catchbasins, and Stormceptor® wastewater treatment systems. Click this link to enter your info and be added to our distribution list. 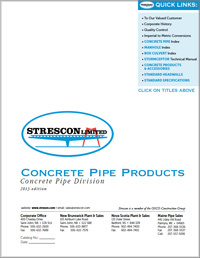 The 2013 edition of our Concrete Pipe Products catalog is now available in printed or digital form. Please click on the image at left to download and view the pdf version. Requests for printed copies can be directed to Strescon's Pipe Department, or by filling out and submitting the form below. The character "*" indicates a required field. Contact me regarding my comments?